At Muddy Waters Cafe, Monday, December 1. 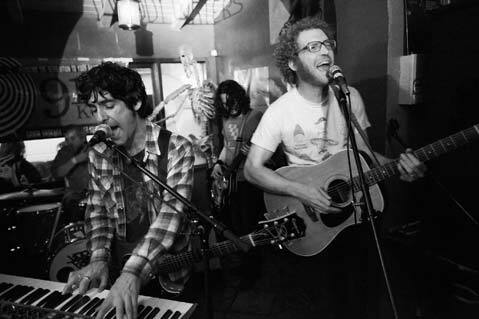 Blitzen Trapper's Eric Earley (left) and Marty Marquis (right) led the Portland-based band through a set of folk-tinged rock-outs on Monday night at Muddy Waters Cafe. Blitzen Trapper are an experimental folk band from Portland, Oregon, and on Monday night they managed quite a feat-filling a club to near capacity on a school night. Their sound is steeped in 1960s and ’70s rock ‘n’ roll, evoking thoughts of a post-electric Bob Dylan hitting the stage with the Doobie Brothers, and featuring a guitarist mentored by Jimi Hendrix. I went into the evening expecting revivalist tunes aplenty, but the band’s atmospheric, experimental guitar licks caught me delightfully off-guard. Starting off their set with “Sleepy Time in the Western World,” the upbeat opening track off their latest album, Trapper filled the coffeehouse with the pounding sounds of old-school organ and driving guitar riffs. Other highlights included the record’s title track, “Furr,” which started off slow and soft, with lead singer Eric Earley’s voice accompanied only by an acoustic guitar. But in between the verses, the whole band came roaring in, as Earley’s harmonica fought loud and strong against the fast beat they created. As the band dropped out, Earley’s sweet voice purred back in, crafting a whimsical fable about transforming from man to wolf to man again. The song embodied a perfect combination of Trapper’s folk and rock elements; quiet enough during the verses to hear the complex, poetic lyrics (one of their greatest strengths), but upbeat enough during the interludes to keep everyone’s feet stomping. “Saturday Nite” was another short and sweet standout in which classic guitar and electro-pop synth riffs dueled against each other, as if lodging a battle over what era Trapper’s music would fall into, 1960 or 2008. As Earley’s voice came back in, though, it was clear that the quarrel would end in a stalemate. The band pulled a great crowd from Santa Barbara’s folk and rock lovers both young and old on Monday. Flannel jackets and artistic beards peppered the crowd, as did the graying heads and Dockers, indicating just how wide-reaching and timeless the band’s sound really is. Trapper’s music is evocative of the outdoors, partly because nearly all of their lyrics have some reference to the woods, hills, wind, or some other natural beauty. But their instrumentation and arrangements seem to suggest something natural, too. Throughout the show, one couldn’t help but want to see Trapper doing their thing at some intimate outdoor fest, rocking out with the wind in their already-mussed hair. But in the meantime, they had no problem fitting into the funky atmosphere of Muddy Waters on Monday-they could have used just a wee bit more elbowroom to do it.